BANGLE (kada) of gold, diamonds, cat’s eye, turquoise, enamel, 9.9 centimeters diameter, Jaipur, Rajasthan, circa 1900. All jewelry from the Ronald and Maxine Linde Collection, except where noted. Promised Gift of Ronald and Maxine Linde. Jewelry photographs by Don Cole, courtesy of the Fowler Museum at UCLA. The jewelry featured in “Enduring Splendor” derives primarily from Rajasthan and Gujarat, on the westernmost periphery of India. The region in question once encompassed the silver-rich Aravalli Mountains, the Thar Desert (also known as the Great Indian Desert), and areas of the Sind region of modern Pakistan. It extended into Gujarat in the south and central India in the east, and it stretched to the foothills of the Himalayas in the north. For many centuries Rajasthan was the gateway to India and came into contact with the great ancient monarchies of Asia. Genghis Khan, Tamerlane and Babur, Alexander the Great and the Greeks, and countless early European visitors, all brought their influence to bear on the region. Communities of pastoral nomads bartered camels and traded gold, silver and gemstones along these routes. Goldsmiths and silversmiths (known as sonis or sonars) who accompanied the caravans exchanged styles, designs and techniques and were subject to myriad influences with the result that jewelry forms often came to traverse great distances. NECKLACE (nagapada tali) of gold, diamonds, rubies, 32.0 centimeters long, Kerala, nineteenth century. THE ANDROGYNOUS FORM OF SHIVA AND PARVATI (Ardhanarishvara) of black schist, 62.9 x 29.2 x 9.5 centimeters, Rajasthan, eleventh century. Los Angeles County Museum of Art; Ancient Art Council and the Indian Art Special Purpose Fund. Photograph courtesy of LACMA. EARRINGS (bhungri) of gold, 3.5 centimeters diameter, Gujarat, early twentieth century. ARMBAND (nagothu) of gold, rubies, white sapphires, 7.0 centimeters diameter, Tamil Nadu, nineteenth century. IDEALIZED PORTRAIT OF THE MUGHAL EMPRESS NUR JAHAN of opaque watercolor and gold on paper, 29.5 x 21.6 centimeters, Kishnagarh, Rajasthan, circa 1725–1750. Los Angeles County Museum of Art; Gift of Diandra and Michael Douglas. The necklace, earrings and armband adorning an eleventh-century androgynous image of Shiva and Parvati, for example, are mirrored in a necklace from Kerala, a pair of earrings from Gujarat, and an armband from Tamil Nadu. This despite the fact that more than eight hundred years and one thousand miles separate the sculpture and the jewelry. Continuity in jewelry designs can also be seen in a stylized eighteenth-century portrait of the bejeweled Mughal empress Nur Jahan. Her earrings, armband and bangle are remarkably similar to pieces in the Linde Collection. From birth to death, jewels form an essential part of samskaras, or rite-of-passage rituals in India. Marriage, pregnancy, the birth of a child—each significant life event is commemorated with special jewelry. A young child is adorned with black bead ornaments for protection from the evil eye. In ancient India sixteen rituals of beautification or adornment were prescribed for a bride in preparation for her wedding. Once ritually bathed, she was adorned from head to toe with jewels. These included ornaments for the braid, a forehead jewel, earrings, a nose jewel, necklaces, armbands, bangles, rings, a girdle, and anklets. Thus attired, she became the personification of a goddess and was elevated from human to divine. EARRINGS (karanphul jhikka) of gold, rubies, pearls, 2.5 × 3.6 centimeters, Orissa, late nineteenth century. Names often provide clues to the tribal affiliation of ornaments, their purpose and their design inspiration. The borli derives its form and name from bor, or the Indian plum, a fruit endowed with powerful medicinal properties; hasli is from hansuli meaning “collar bone;” and champakali are the buds of the Michelia champaca flower. Flowers, leaves, fruits, and berries have been incarnated as ornaments and reflect the importance of agriculture. The pahunchi bracelet with its spikes simulates large thorns that grow in the desert and was worn to keep animals at bay. While it is highly unlikely that these spikes could actually function as an effective weapon, they symbolically provided protection to the wearer. Ornaments have long been thought to enhance fertility; to protect against unsettling effects of the planets; and to serve as talismans against danger. The mere act of adornment—placing a pendant around the neck or encasing a wrist with bangles—does not, however, make a jewel work its metaphorical magic. The form of the jewel, its construction and the motifs or gems that decorate the surface, combine to unleash the requisite powers. Emeralds, for example, were carved with floral motifs and holy verses, and worn as an armband. Pendants were decorated with images of gods, goddesses and symbols to heighten their potency. A necklace, a pendant, a ring or an armband set with the nine planetary gems, navaratna, might be visually attractive, but the nine gems alone do not work any magic. When they are arranged with a ruby symbolizing the sun in the center, and surrounded by the other gems, however, they become able to harness the energies of the cosmos and draw those energies into the individual. BRACELET (pahunchi) by Dharmendra Soni, of silver, 22.5 centimeters long, 2014. Fowler Museum at UCLA museum purchase. HEAD ORNAMENT (borla) of gold, pearls, diamond, enamel, 4.2 centimeters diameter, Udaijpur, Rajasthan, circa 1920. Wearing jewelry is also believed to have physiological benefits. A branch of traditional Indian medicine known as Marma Shastra maintains that there are vital points, marma, located along energy pathways that run through the body. Gentle pressure and stimulation of these points enhances fertility and releases energies contributing to physical and emotional well-being. PENDANT (navaratna padak) (reverse and obverse) of gold, emerald, rubies, white sapphire, citrine, amethyst, tourmaline, turquoise, coral, rock crystals, pearl, enamel, 7.0 x 4.2 centimeters, Deccan, circa eighteenth century. RABARI WOMAN wearing a silver vadlo torque, Kutch, Gujarat, 2010. Photograph by Thomas K. Seligman. Men and women have long pierced their ears and suspending ornaments from them as this is believed to open the mind to learning, broaden the intellect and enhance fertility. Amulets are usually worn around the neck or are tied around the arm—both locations of vital marma points. The weight of an ornament gently stimulates the point while the power of its motifs (verses and symbols) and the potency of the material (gold, silver, jade, and so on) works the magic. Heavy torque necklaces, such as hanslis rest on the collarbone releasing energies that provided relief from muscular and joint pains, improved digestion and aid in the elimination of toxins. Cuff bracelets serve a similar purpose functioning almost like a brace and support for the arm, while an amulet with the coiled body of a snake not only promotes fertility but also activates energy points enhancing sexuality. The head is the seat of all consciousness and the spiritual fulcrum of the body, mind and intellect; thus head jewels metaphorically regulated spiritual energy. Jewelry ensured that the rhythm of the body was always in equilibrium. Jewelry and gems feature in classical Indian literature through the ages with Rama’s signet ring and Sita’s head jewel, for example, playing significant roles in the Ramayana. In the Buddhist Jatakas, the jingling of bracelets by themselves is considered among the thirty-two good omens that appeared when the Buddha became incarnate. In the Kama Sutra, women were required to have knowledge of gold, silver, jewels, and gems, as well as of housekeeping and the arts of singing, dancing and composing poetry. They had to be well versed specifically in stringing necklaces and designing beautiful jewelry. The sound of tinkling bells on anklets, the sparkle of a diamond in the nose, and flower blossom earrings all worked to enhance sensuality. A FARMER FROM THE GUJJAR COMMUNITY wears a pair of gokhru earrings, Pushkar, 2009. Photograph by Thomas K. Seligman. Ornaments also serve to dispel anonymity, proclaim caste, religion and ethnic identity, and even unequivocally communicate an individual’s region of origin. This is particularly the case among tribal and pastoral communities. Massive silver vadlo and hansli torques are worn by Rabari and Fakirani Jat women in Gujarat and Rajasthan, while male members can be recognized by the single horse-shoe shaped bawaria earring and the thorny gokhru. Strikingly abstract thandatti and pambadam are unique to Vellalar women in rural Tamil Nadu, and large rings joined with faceted beads known as mekkamotiram are worn on the helix of the ears by Syrian Christian women in Kerala. The fabulous kali thiru marriage necklace is a trademark of the Natukottai Chettiar community in Chettinad. Devotees of Shri Nathji wear pendants bearing an image of the god. In fact, for women of the Bonda tribes of Orissa—as well as for Nair women in nineteenth-century Kerala—ornaments and costumes merge and become one with the body. Jewelry functions almost like clothing—row upon row of elaborate necklaces covering the entire chest. Sonis in most parts of India, especially South India and Bengal, consider themselves to be descended from Vishwakarma and along with the four other communities (blacksmiths, carpenters, metal casters, and stonemasons) occupy an ambivalent position in the Hindu caste order, neither at the topmost nor at the bottommost rung. While Brahmanical texts refer to them as silpis and assign them the rank of sudra (lowest of the four traditional castes), they credit themselves with the primordial act of creation and trace their origins to the “pre-brahminic and pre-caste period.” By virtue of the fact that they “built temples, sculpted the deities, made their ornaments and these were pure and sacred acts,” they claim a social prestige equal to the Brahmins (the uppermost caste). EARRINGS (durgla ihumar) of silver, 8.3 - 8.4 centimeters long, Rajasthan, early twentieth century. ANKLETS (kalla) of silver, 13.3 centimeters diameter, Rajasthan, nineteenth century. The process of transforming a lump of shapeless metal into a beautiful object of adornment was not only a manual task but also a spiritual ritual. For, as Ananda Coomaraswamy, the renowned philosopher-historian of Indian art, explains, “The craftsman is not an individual expressing individual whims, but a part of the universe, giving expression to ideals of eternal beauty and unchanging laws, even as do the trees and flowers whose natural and less ordered beauty is not less God given.” Though a piece of jewelry is not signed or stamped with a hallmark, it bears the fingerprints of its maker. No two jewelry items are identical and no two pieces within a pair are exactly the same. An extra granule, a wire that did not get perfectly twisted, a slightly off-center flower—each piece is unique. BRACELETS (chood or kadla) of silver, 10 centimeters tall, Gujarat, nineteenth century. ANKLETS (sankhla) of silver, 12.5 centimeters diameter, Gujarat, late nineteenth century. There are no metalsmithing schools, and no technical manuals. In accordance with the guru-shishya parampara—the tradition of the father assuming the role of guru, or teacher, and transmitting his knowledge to his son, the shishya, or student—sonis were all formerly apprenticed to their fathers or to an uncle. Their learning consisted of watching, listening, practicing, performing small tasks, and eventually executing assigned pieces of work to the satisfaction of their teacher. The soni designs the piece of jewelry; casts, beats and twists metal into forms; sets gems; decorates surfaces with patterns and enamel; and finally polishes the finished piece. The vocation of a soni is strictly the domain of men, and women are neither trained nor allowed to work in the profession. Shyama Devi, however, the patua, or stringer, who threaded the individual spike elements made by Dharmendra Soni into a beautiful, flexible silver bracelet (pahunchi), is a woman from the Lakhera caste, a community traditionally associated with making shellac bangles. Throughout Rajasthan, women of the Lakhera caste string pendants and individual components into necklaces and bracelets. An item of jewelry begins life as raw materials in the workshop of the soni. Silver pieces are handcrafted one at a time, mostly on commission, and the weight of the ornament is carefully calibrated to individual specifications depending on the budget. Soni workshops today are small and family run, and they are usually located in the front room of the home, overlooking the street, while the family resides in the back. Specialization in the various stages of manufacture, such as casting, repoussé work, gem setting, enameling, and so on, are all nurtured within the family. While one solid silver necklace in the Linde collection, for example, was made using the sand-casting process, another elegant torque was created by hammering silver into a thick sheet, cutting out the form, and then engraving peacocks and flowers on the surface with sharp tools; in other pieces, a nose ring is intricately decorated with minute gold granules; and extremely sophisticated repoussé work is conspicuous in the fine detail on an amulet. HANUMAN SONI is cutting silver with a chisel. Note his working on the floor, with anvils mounted low, and the use of the foot to hold the workpiece. Photograph by Thomas K. Seligman. 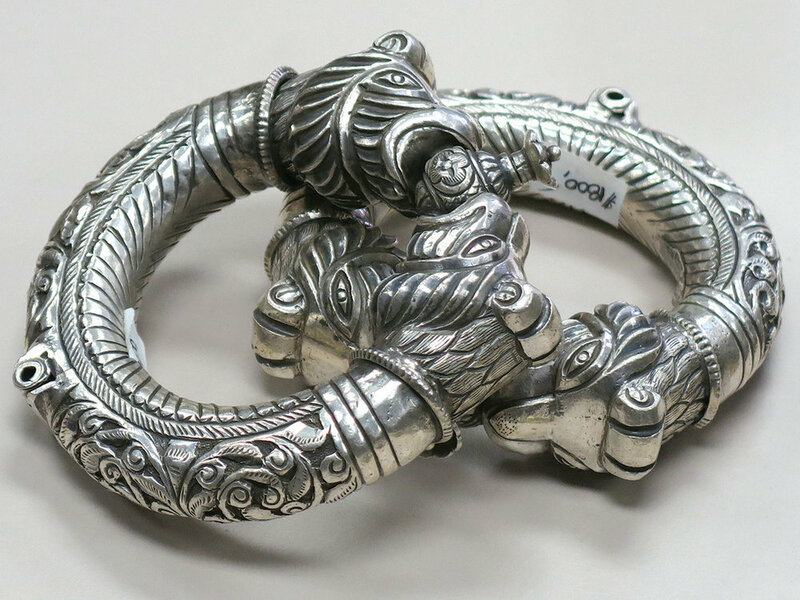 BRACELET (katria) by Hanuman Soni of silver, 10.5 centimeters high, 2014. Fowler Museum at UCLA museum purchase. JEETU, Hanuman’s son, is making a design in silver strip by striking a chisel with a hammer. Photograph by Thomas K. Seligman. An unknown smith made a pair of anklets known as sankhla using cire perdue, or lost-wax casting, to fashion an amazingly flexible set. In an exquisite armband (bazuband), the gem setter embedded precious and semiprecious stones within ribbons of pure gold, and the enameler formed cavities and filled them with vibrant colors in an astonishing pair of bracelets (gajre, see Cover). While the preferred metal for setting precious gemstones was gold, silver was usually set with synthetic stones and foil-backed glass to simulate real gems. Transformations taking place in the artisan community straddle the rural and the urban, the traditional and the modern as they reinvent themselves to adapt to the challenges of a rapidly changing world. Departing from tradition, another soni in “Enduring Splendor,” Bhagwan Das, no longer manufactures jewelry himself but has stayed true to his caste occupation by becoming a retailer of jewelry. He has seized the opportunity afforded by arrivals of large tourist groups in Jaisalmer to offer his expertise and knowledge to an international clientele, which he has assiduously cultivated. Hanuman is perhaps the only one of the four sonis in “Enduring Splendor” who continues to conform to tradition, replicating traditional forms with the same decorative details, perhaps bound by the sanctity of meaning enshrined in them. While the price of the metal may be too high to allow for the liberty of experimenting with new forms and designs, Hanuman, like most sonis, follows a structured, coordinated and synchronous division of tasks in the workshop that is efficient and time saving and that he is reluctant to change to try something new. He has trained his sons in jewelry manufacture, and they continue to be apprenticed to him, learning the many technical aspects of the art and executing assigned tasks. Hanuman’s son Jeetu has expressed a desire to forsake the family trade and pursue a career in computers in the city. As a Medh soni, however, Hanuman insisted that his son uphold the pride of his “warrior” lineage and learn the trade into which he was born. It is this hereditary transmission that results in the continuity of skills and the perfection of accumulated generations of artistry and finesse. The lure of the city and a nine-to-five, white-collar job, however, still tempts Jeetu. Coomaraswamy reminds us “the best things are always well rooted in the soil.” Nowhere is this more evident than in the beautiful organic and geometric forms and decorative motifs inspired by nature that figure so prominently in Indian jewelry. The feathers of a heron, shells, jasmine buds, chrysanthemum flowers, and all manner of flora and fauna, including marine forms such as shells are stylized in objects of adornment and decorative motifs. Over time, the manifold original meanings and connotations of abstract motifs have become blurred, lost in transmission and set aside as a consequence of changed lifestyles. Even the craftsmen are no longer cognizant of these symbolic codes, merely adhering to long-established designs and motifs and replicating them with mechanical precision. While the abstract form of a silver torque made by Hanuman Soni with its solid cuboid centerpiece might look contemporary, minimalist and unusual, the genesis of its long-standing design is lost forever. The striking design of pieces like his allows them to transcend time. In India, the relationships that exist between jewelry and society, artist and jewelry, and artist and society are profound. Inextricably intertwined are the historical and cultural contexts of ornamental forms, materials and techniques. 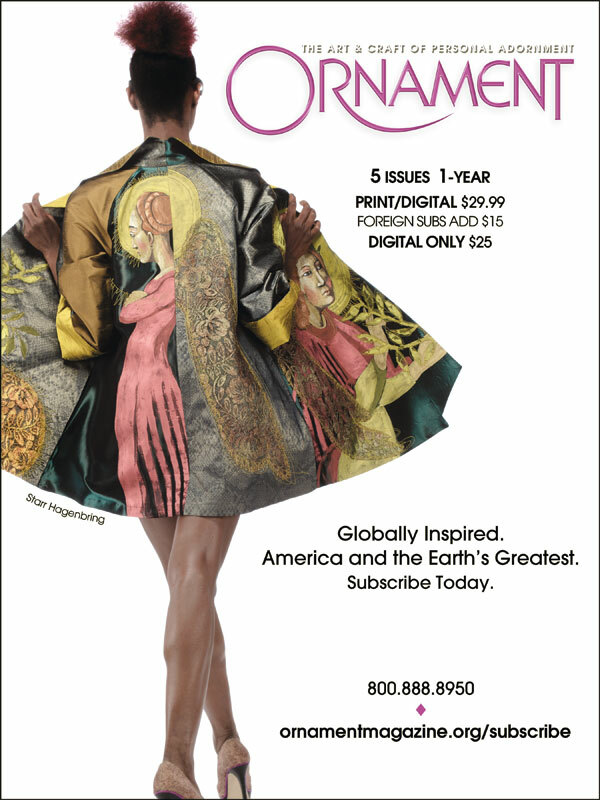 Among the manifold varieties of human creation, it is instructive and exhilarating to understand that the art of personal adornment goes far beyond merely appending beautiful pieces crafted from gold and silver to the body. Ornament thanks the Fowler Museum at UCLA, the assistance of Erin Connors, and with special recognition to Ronald and Maxine Linde. The Ronald and Maxine Linde Collection of Jewelry and Ritual Arts of India has been assembled over three decades, and guided by the Lindes’ belief that their collection will help to shape a continuing study of Indian jewelry—design, craftsmanship, spiritual interpretation, and cultural content. Seligman, Thomas K. and Usha R Balakrishnan. Enduring Splendor: Jewelry of India’s Thar Desert. Los Angeles: Fowler Museum at UCLA, 2017. Balakrishnan, Usha R. and Meera Kumar. Dance of the Peacock: Jewellery Traditions of India. New Delhi: India Book House, 1999. Borel, France. The Splendour of Ethnic Jewelry: From the Colette and Jean-Pierre Ghysels Collection. London: Thames and Hudson, 1994. Hendley, Thomas H. Indian Jewellery. Repr. Ed. Delhi: Low Price, 1896. Neubauer, Jutta. Chandrika, Silver Ornaments of India. New Delhi: Shisha, Manchester, in Association with Timeless, 2001. Untracht, Oppi. Traditional Jewelry of India. New York: Harry N. Abrams, 1997. ANKLETS (kadla) of silver, 11.5 centimeters diameter, Gujarat, early nineteenth century. TORQUE NECKLACE (hasli) by Hanuman Soni of silver, 15 centimeters diameter, 2014. Fowler Museum at UCLA museum purchase. 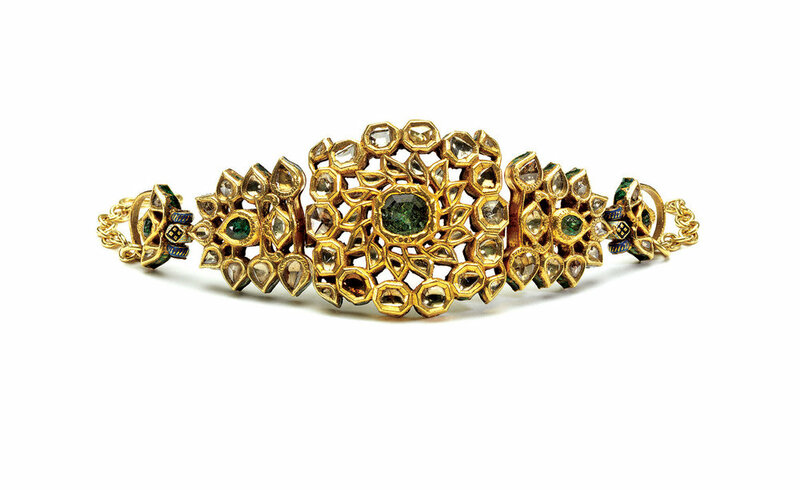 ARMBAND (bazuband, obverse and reverse), of gold, diamonds, emeralds, enamel, 3.7 x 10.5 centimeters, Jaipur, Rajasthan, nineteenth century. NOSE RING (nathad) of gold, topaz, showing miniature granulation, 5.1 x 4.4 centimeters, Gujarat, late eighteenth to early nineteenth century. Usha R. Balakrishnan is a freelance scholar based in Mumbai, India. After obtaining a post-doctorate degree in Museum Studies at New York University, she worked as a research associate at the Brooklyn Museum. Her publication Dance of the Peacock: Jewelry Traditions of India (1999) reflects her research on the five-thousand-year history of Indian jewelry. In 2001 the government of India invited her to study the fabulous collection of gems and jewelry that formerly belonged to the Nizams of Hyderabad, where she published her book Jewels of the Nizams. She has also curated “Alamkara: The Beauty of Ornament,” an exhibition of the permanent collection of Indian jewelry at the National Museum, New Delhi, and been a guest curator for “India: Jewels that Enchanted the World” at the Kremlin Museum, Moscow, while contributing essays to or authoring the catalog. AMULET NECKLACE (haar) of silver, glass, paper, and paint worn by Hindus. WRIST BRACELET of silver worn by Rabari tribes of Gujarat. AMULET (sikka) of silver, pearls, turquoise, coins, and carnelian. Photographs by Patrick R. Benesh-Liu. We live on a planet where the global neighborhood has broadened, with once great distances being traversed daily. The land and sea between continents are not the barriers they once were, even for those who live in small towns and villages. Worlds that were once far apart may meet, as is the case with Rajasthani goldsmith, Bhagwan Das Soni, or B.D. as he is more well known, who graced the Fowler Museum at the University of Los Angeles with his presence and wares one mildly overcast afternoon this past May. At a one-day trunk show featuring his work, exactly eight thousand, one hundred and seventy six miles away from the city in which he resides, people who might never have met had a chance to share in their passion for jewelry, culture and the handmade, face to face. Coinciding with the Fowler Museum’s exhibition on East Indian jewelry, “Enduring Splendor: Jewelry of India’s Thar Desert,” this event brought to the West Coast one of the four Rajasthani jewelers whose work, and livelihood, was researched for the exhibit. In 2002, Bhagwan Das was one of two Indian goldsmiths invited to the Smithsonian Silk Road Festival in Washington, D.C., a show he has since used to make engagements and pursue connections in the United States. On the second floor of the museum, in a small room perhaps used for meetings, a literal treasure trove spilled out over several tables. Jewelry from all over India, Pakistan, Nepal, and Afghanistan mingled with more contemporary work made by B.D.’s family. A stream of visitors, both ardent collectors and those simply looking to add a little flash to their wardrobe, wandered from display to display, occasionally asking a question regarding material, origin or technique that he unhesitatingly fielded. It was as if the contents of a jeweler’s store in India had been transported to a foreign land and set out as a sumptuous repast. The history of B.D.’s family in goldsmithing goes back nine generations, an unbroken line of tradition tying past to present. His father, Govindlal, worked for the Maharajah of Jaisalmer, as did his father, Inderchand. The Inderchand family originally heralded from Sind, a migration that dates back roughly eight generations. Govindlal himself had seven daughters and four sons, all of whom are either married to, or are, sonis; both the family name, caste and tradition, sonis are jewelers who work in gold, although they can also make objects from silver, brass, bronze, and copper. Part of the Soni caste of jewelers in the Thar desert region, Soni is a popular surname for goldsmiths in Rajasthan—thus Bhagwan Das Soni’s name is both occupation and title. BHAGWAN DAS SONI AND KATHY DIGENOVA, Museum Store Manager at the Fowler Museum at UCLA. B.D’s beginning as a goldsmith can be traced to childhood, when at the age of twelve he would carry his father’s tools to the workshop and sit with him, watching the master at work. It was through careful observation that B.D. learned his father’s craft. Once he felt his son had absorbed enough lessons, his father let him play with the least expensive of materials, copper, with which he fabricated simple rings and earrings. Slowly but surely, more valuable materials were supplied, silver, and then gold. A brief interlude took place as his father pushed him to work for the government. “When I was seventeen years old, my father encouraged me to become a civil servant because he thought my financial future would be more secure,” B.D. remembers. “I tried it for nearly one year before resigning. I didn’t like the work and wanted to return to making jewelry.” By the age of twenty, he had become an expert in granulation, and at that point began to work independently. He established his own shop, and has now built up their operation to the point where his sons are largely responsible for producing the jewelry. In a city steeped in tradition as Jaisalmer those techniques and skills are well alive. Bhagwan Das Soni’s presence in an American museum was a reminder of the different worlds of creativity that inhabit our planet, separated by distance yet sharing that same appreciation for a life lived with care and a respect for the beautiful.